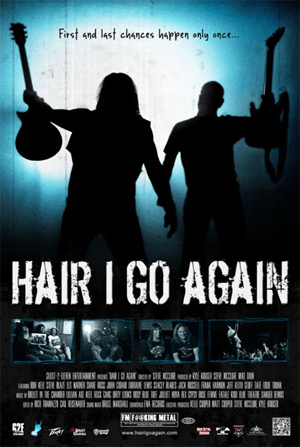 The 80's documentary about a former hair band trying to relive their dreams, Hair I Go Again, will get an official worldwide release on March 10th. The movie will commence its US Film Tour on Tuesday, March 8th in Dallas, TX followed by the film’s SXSW Invasion, slated for Thursday March 10th in Austin. Denver based filmmakers Steve McClure and Kyle Kruger will present Hair I Go Again, via various hosted film screening events through the summer of 2017. The year was 1985. Thousands of miles away from the sonic debauchery of the Sunset Strip, two teenage friends shared aspirations of glam rock grandeur. Freshly permed and taking a page straight out of Hit Parader, a hungry, determined band was born. Fame and fortune, however, remained out of reach and the group unceremoniously imploded...probably over some chick. Fast forward thirty years. Facing a mid-life crossroads, Kyle Kruger and Steve McClure set out on an improbable journey in order to fulfill their dreams of achieving rock & roll stardom. With credit cards maxed out and the 401K cashed in, the pair risk everything in hopes of reclaiming the magic they had as a band over a quarter century ago. Featuring candid interviews with some of the most influential musicians and industry professionals in the business, including Eddie Trunk (That Metal Show), Jeff Keith and Frank Hannon (TESLA), Ron Keel (KEEL), Steve Blaze (LILLIAN AXE), Frank Bello and Joey Belladonna (ANTHRAX), Les Warner (THE CULT), as well as members of KIX, STRYPER, QUEENSRYCHE, QUIET RIOT, WARRANT, MOTORHEAD, LA GUNS and more.